Below is a list of current Australian researchers recruiting for participants. Please direct any queries about specific studies to the contact of the study. You can search for a study by state or select All States for those studies which are national. If you have a diagnosis of dementia or care for someone with dementia at home, you may be eligible to participate in this research project. Accumulation of an insoluble protein called amyloid in the brain is an early indicator of dementia, particularly Alzhemier’s disease. Currently, the most precise way to measure amyloid levels in the brain is through an imaging technique called Positron Emission Tomography (PET) that exposes the patient to radiation. Carers' CARE (Mobile App) to assist dementia carers' coping resilience - scoping consumer technology use, preferences and expectations. 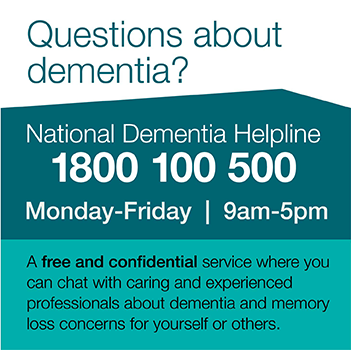 Do you support a family member with dementia? If so, we are interested in your thoughts on support for carers, and how technology might be used to help provide support for carers. This program is currently seeking patients with a diagnosis of Mild Cognitive Impairment or early Alzheimer's disease who are interested in joining a therapy (drug) trial. Patients are assessed to determine their likely eligibility for trials accepting new patients in Melbourne Victoria, and referred to these trials as appropriate. You are invited to take part in an international research study that is investigating the effect of three types of physical exercise on brain health and physical function in older people with memory concerns. Caregivers of people with dementia experience grief even before their loved one has died. Previous research looking at this pre-death grief is limited and primarily undertaken with families affected by Alzheimer’s disease (AD), the most common type of dementia. Research into caregiver grief in other dementia types is lacking, even though we know they differ in many important ways. This study aims to provide an in-depth and objective description of the nature, severity and progression of eating behaviour and swallow function (dysphagia) in frontotemporal dementia (FTD) and associated disorders. We invite you to take part in a survey to identify the health impacts of providing care for an individual with dementia. In particular, we are interested to see if sleep is disrupted and how this may affect physical well being.